I start with the standard Google search for “scan to pdf” and it brought up a number of different applications, all commercial, with some free offerings. Most had some kind of free PDF creation application that tied into Windows’ printing function…allowing you to select a PDF “printer” just like Adobe Acrobat does….except without the big price tag. All of the top Google results did not have a free scan to pdf application…some had trialware, but they all watermark the the image that is created so that you will buy the application…and, I am being cheap today. UPDATE 2/24/2012: Matteo Rossi just dropped by (see comment below) that significant improvements have been made in version 1.5 of iCopy including support for ADF or Automatic Document Feeders. When you first install iCopy you have the option to let the button on your scanner “notify” iCopy of the coming scan. None of the other applications that I used had this functionality (that I could see). iCopy makes it easy. Once installed, the main iCopy application is small, clean and simple. As you can see, there is not a lot going on and only the necessary items are in front of you. The first drop down box allows you to specify what the scanner should be looking for: Colors, Grayscale, or Text. Using colors makes for a slower scanning pass, grayscale a little faster and text much faster. Selecting the Printer drop down box, you will find two options: color or black and white. The last drop down for Paper Size allows you to select paper sizes you know and have never heard of (and probably never will again)…let’s just say they have you covered no matter what you are scanning. The first order of business is to configure the scanner. I was fortunate to find a Windows 7 TWAIN driver for the Epson Perfection 1650 on the Epson website and clicking the “Choose scanner…” button revealed the scanner straight away. 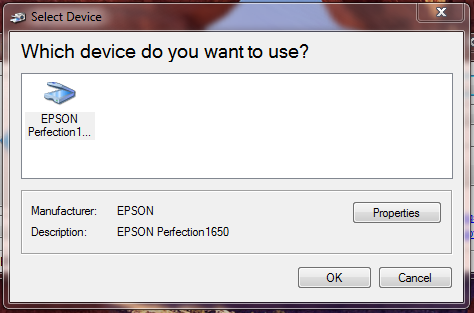 The Epson Perfection 1650 was found by iCopy right away. Next order of business is to configure the printer options. Clicking the “Printer Options” button brings up the standard Windows printer selection window. I selected CutePDF Writer so that when I scan and print the documents, PDF files will be generated automatically. NOTE: It can take a bit for CutePDF Writer to spit out the pdf file depending on the resolution you select…be patient fast clickers. This printer is saved as the default for iCopy NOT for Windows. 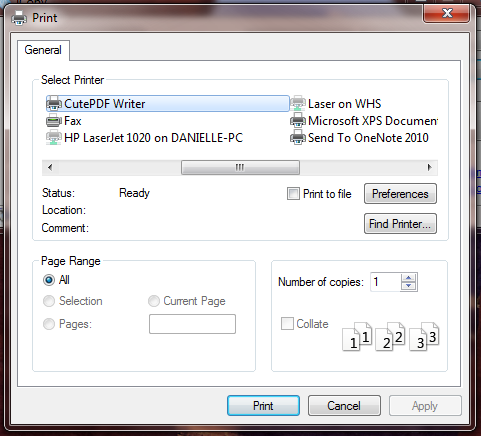 Selecting CutePDF Writer as the default printer for the iCopy application. Last, we need to configure the image settings. You can change the Brightness, Contrast, Scaling, Resolution and the JPEG quality (as it is creating an image when scanning). I left the first 3 alone, but stepped up the resolution to 600dpi. This made for pretty nice scans that were not outrageously big. You can select resolutions from 75dpi up to 1600dpi. Setting the resolution to 600dpi in iCopy. One of the nice things that iCopy does on the main screen (see first image above) is show you what scanner and what printer you have selected. Not something you normally find, but very thoughtful and useful. 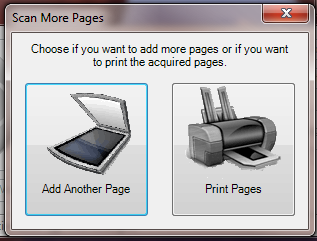 Add more pages or print the ones you have scanned. If you have more pages to add to the file, click “Add Another Page,” otherwise, click the “Print Pages” button to output to a PDF using CutePDF Writer (or your PDF creation application of choice). Overall, this is a very workable and simple system to use if you are too cheap and too lazy to get a document scanner. The PDFs I created using this combination were quite nice and worked well for our needs. Thanks a lot Jason. This article helped me a lot. good article, My wife asked for help with her new HP printer and as my work is based around users experiences my jaw hit the floor at how incredibly unhelpful and utterly crap the bundled software was just to scan to PDF. I like you started to try different apps only to see all this nonsense, watermarks and ads….all just to scan to flippin PDF. Thanks for your sharing your solution, really helps! Thanks for the post. This solution (iCopy + CutePDF) does exactly what I needed. Perfect solution! Thank you so much! This corrects Microsoft’s inability to include “Scan to PDF” functionality in Windows 7 natively. I searched all over and had the same bad experiences you did. ~Not any more! I’ve been sitting here for hours trying to get some of the other “free” software to work with my printer/scanner. I thought I was missing needed drivers etc. Very complicated and frustrating! I’m a secretary for a non-profit club and really need this for posting handouts to our club website. What you outlined did exactly what I needed in just a few minutes. Thank you for sharing! This is a simple but great way to keep using my old scanner – many thanks! Thank you for posting the blog – it was most useful in that I have not been able to scan in a lower resolution than 300dpi from a HP C7283 Photosmart All-In-One printer due to HP’s new drivers. Your solution has given me flexibility to scan below the 300dpi threshold that HP now dictates. Everything worked just as described. There is only a problem: How would you rotate the page if it doesn’t come right from the scanner? Perfect Solution! Thanks for the article. Does this work with a scanner/printer with a feeder as well? I tried doing this but it will only allow me to scan through the scanning bed, not the feeder. Sarah and Cathleen, I don’t know about your document feeder issues…my scanner is super old school and doesn’t have one. I went through the same search you did to find a suitable scan to PDF solution and had the same results. The ones I found were either not free, put a watermark on the document or did not allow me to control the scan quality. I can’t thank you enough for this blog. It was exactly what I needed. May I offer a suggestion that you always choose color even if scanning documents. When I chose grayscale, the pdf was not “pretty”. I already had CutePDF, so I only had to get ICopy. Thanks again! You have just saved me! I’d already wasted hours trying to get four pages scanned through my Canon MP450 into something/anything that I had to return today for an important transaction. Everything you described and pictured worked perfectly! Thank you for taking the time to write this excellent solution! Thanks for the tip. 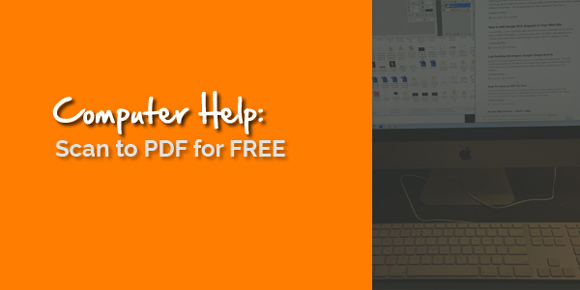 There are so many good, free PDF tools available now – this made it seem all the more frustrating that “Scan to PDF” seemed to be so difficult (or costly). I have a 1650 as well, and use Bullzip rather than CutePDF. Works a treat with iCopy. You are my hero of the day! I ran into all the same problems and two hours later found your blog. Job application scanned, merged, and emailed. Thank you! Was given an old HP4300c flatbed that works great – and now with the iCopy/CutePDF combo it’s become very useful! Installation was very straightforward and your operational guidance was right on target. Thanks again for pulling this together! This solution is perfect. It’s fast and easy. Thank’s a lot !!! Just use XnView, it works great and it’s free! Thanks! This was a great help and saved me a bunch of time searching online! Simple and effective. I used Windows Fax and Scan on my Windows 7 machine, imported the pictures to a Word Document, adjusted their alignment, then did a Save As… to PDF. Worked great. Oh man. Thanks a whole bunch. This works very well. This is awesome! Just what I was looking for. Install is small, simple, and it’s very easy to use. Makes my old Epson Perfection 1240U useful again. I just tried this option and it works like a charm! Thanks for posting! I knew before I bought my new Windows 7 computer that my HP Scanjet 3500c was no longer supported. I need to scan multi-page documents to PDF and figured I’d need to buy a new scanner. Your suggestion works great and is perfect for my needs. Thanks! Great Solution!! Thanks!! Any recommendations for the best utility for combining multiple PDF files into a single PDF? Thank you for this post! Like others i thought i could find a free scan to PDF app – and yes every single one is crap. I ended up using iCopy and PDF Creator – brilliant. I note that iCopy will soon support the ADF (feeder) on the scanner too. Thank you!! This is exactly what I have been looking for to scan in documents and keep them under 150kb. Now I can upload them and hopefully get a job!! Thank you so much. Works like a dream. Just what I was looking for and had been unable to find. Thanks! It even supports multiple pages! LewMan – try pdfsam – has been great for me. Brilliant. Sorted our neighbour out with a dell 928 in 5 minutes. This seemed to work fine…until I opened the resulting PDF and found it had only scanned the upper left corner of the pages… every…time. I’m sure you can understand how frustrating this is. And, yes… I have set the paper size to letter… I’m at my wits’ end. I was already using CutePDF, but needed a solution for multi-page documents. iCopy works perfectly. Thanks!! Worked great for me. Thanks a bunch!! I was already using CutePDF, and wanted to scan to PDF direct rather than JPG. This solution went further and solved multi-page scanning too! Dell Photo 928 printer. Took only 5-7min. THANK YOU! Only issue is… if I want to use the Preview feature (to crop scans to a selected area) then it ends up scanning the wrong part of the page! Thanks for this, very nice free solution for scanning PDFs! Thank you for the great advice. Your step-by-step instructions were invaluable, and I’m successfully scanning to PDF for the first time ever. Spent a long time looking on the net before I found your site . Got the PDF file and they work !!! Thanks for sharing and all the best from England. Brilliant Jason, thanks so much for this great article! I have a need to often scan to PDF. I recently reformatted my hard drive and the program I used to use, Scan Operator, seems to no longer be available. I paid for it years ago and now can’t get support as it looks like the company has shut up shop. After trolling through all of the watermarked trial versions of software I was fortunate to come across your article and it has worked a treat. Thanks for going to the trouble of letting people know about this great solution! Thank you for this post. I wound up using IrfanView and Bullzip PDF Printer. I set IrfanView to scan to a TIFF file. For a typed document, this combination produced a PDF file of about 1/3 the size of the other solutions I tried. My guess is that using an uncompressed TIFF intermediate file caused the PDF file to be much smaller. Works great with Vista and old hp sj 4570C (that hp said was no longer supported after Win98). Keeps those old scanners out of the landfill! This was so helpful. Thank you for being so helpful and generous with your knowledge. It saved a printer, scanner and some of my sanity today. YOU ARE A GOD !!!! Thanks. , this is very helpful to a college student trying to find easy and free ways of doing things. Saved me some sleep. Just wanted to say thanks for a great article. Was helpful and just used it to scan in a quick document I needed to PDF! Thanks so much for writing this solution and sharing it. You might want to update to reflect that Ghostscript is no longer included in Cute PDF and will also need to be downloaded and installed. Awesome simple solution and FREE. . .great price. Very helpful, thanks!! Awesome solution, I was looking for this for ages, thanks for sharing ! For those of you who, just like me, ran into the fact that it scans/prints only a part of the document you want to scan: don’t select a paper size; if you have done so; close the iCopy and start it again and just don’t touch the paper size dropbox and it works (at least for me). You are genius dude. This combined solution of iCopy + Cute Pdf Writer works just fine. Very cool idea. Thanks for sharing! Only problem on my end is that when I tell it to start, even if I have multiple pages in the loader, it still scans the (empty) flatbed. Any ideas? Man, you are saving people all over the world with this post! Thanks a lot! My wife has been looking for a good way to save multipage recipes from magazines and this is great. By not using the ‘preview’ option, she can just scan-scan-scan-print and it’s pretty darned quick! HP really limited support for her old scanner on Win7, but this solution works great on WIn7-64 bit! Simple and works VERY well. Thanks. Thanks for the article. We ended up with over 40 pdf images. I needed to combine my scans into one on the Mac – we ended up using Batch PDF Merger. I think there is a Windows version as well…pretty nifty program and FAST! That was a complete waste of time and I am going to be upset if I downloaded a virus. I just downloaded the latest stable release (1.49) on 64bit Win7 Pro and it works fine. I am not sure where you downloaded it from, but the project files are located on sourceforge. Almost 2 years later and this article continues to help people with scanning to pdf. Thanks a lot OG Jason! Cutepdf is an excellent program for creating pdf files from Word documents. A friend has also told me that you can use Cutepdf to break up a large pdf file into smaller components. You open the pdf and then print to pdf – specifying the specfic pages. He used an Apple program … I’m using Apple Mac software, so there’s a built-in program called Preview that opens PDFs… and all software can “print” to a PDF. So what I’ve been doing is just “printing” certain pages into separate PDFs and doing it that way. I have been trying to work out how to do this for a while – so thought I would post it on the net. Sorry if this is old news to you. I also read the post about Batch pdf merger. That is great to know as well – so I can not only split up a large pdf file – but also combine multiple small ones. Your blog seems to have helped many people. I’m reading the compliments and I’m so jealous because with my WIN XP it doesn’t work!! O Jason !! What can I do??? For those who are seeing only partial page scans, I found a solution that works for me. I check “preview” then just click on the “scan” button when the preview pane appears. For some odd reason, this prods the program to scan the entire page. Perhaps this is just a drivers issue with our particular printers? I did try the other solution listed here — do not select page size — but this did not work for me. Again, thanks for doing the footwork for us in finding a free PDF solution. I’m the author of iCopy, and I wish to thank you for your article. I’m glad you and many of your readers found my product useful. I would also like to announce that I released version 1.5 of iCopy. This version, together with lots of improvements in compatibility and stability with many scanners, includes ADF (Automatic Document Feeder) support, so I encourage everyone who had problems with the previous versions, or has a ADF scanner, to try it out. Finally, if anybody is having problems with the software, they can ask for support on Sourceforge.net webpages and I will help them to have iCopy working with their scanner. Thanks everybody, keep up with the good work with this website! Jason — Thank you so much! My HP3055 won’t scan to PDF format on Win 7, so using your fix works quite nicely. Thanks Jason! This article is fabulous! You just saved me a lot of gas money running back and forth from the office to utilize the scanner at work, since I couldn’t figure out to scan to a pdf at home. Worked like a charm!! My dad had to send me a document and being in different countries makes it really hard to walk him through steps. This was easy and I got the document in 10 min, including installation of iCopy and CutePDF. Awesome, thanks!! Even with the age of your recommendation, this still works like a charm. You’re a Saint. Thanks! Thank you for publishing the step by step guide. A fantastic solution to make my otherwise unusable (since upgrading to Win 7) HP 3030 scanner perfectly functional. I use Primo PDF rather than CutePDF but the combination with iCopy is what makes it work so well. Hey Jason, Thanks a bunch for the tip. Its surprising that this wonderful project isn’t more popular. It completely solves the scan-multiple-pages-to-pdf-using-a-cheap-crappy-all-in-one-printer problem. And all using open source GPL softwal. This is awesome, works very well. Thank you very much. I look forward to downloading and trying this software. I don’t understand why this feature is not built in. It is very important to me in my work to be able to scan multiple page documents into pdf format. That is what I’ve searched. I had quite many phases in my solution: acquire from scanner to Paint.net image and then “print” it with cutePDF. Your way is simplier! Since this very useful site comes up on google searches, I am posting an observed update. iCopy now supports scanning multipage documents one page at a time on a flatbed scanner and outputting the result to a single pdf file. In the current version, below the big blue button, are three icons, one for multipage acquisition, one for save the image to a file, and one for save the output to pdf. Simply click on both the multipage acquisition icon and the save the output to pdf icon before pressing the big blue start copy process icon. No need for CutePDF in this case. 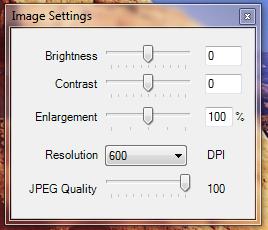 I would also suggest cranking up the default resolution using the image settings button, from 100 dpi to 200 or 300 dpi, particularly if you select scanner method of text on the main screen, if you want results that won’t cause eye strain in most cases.